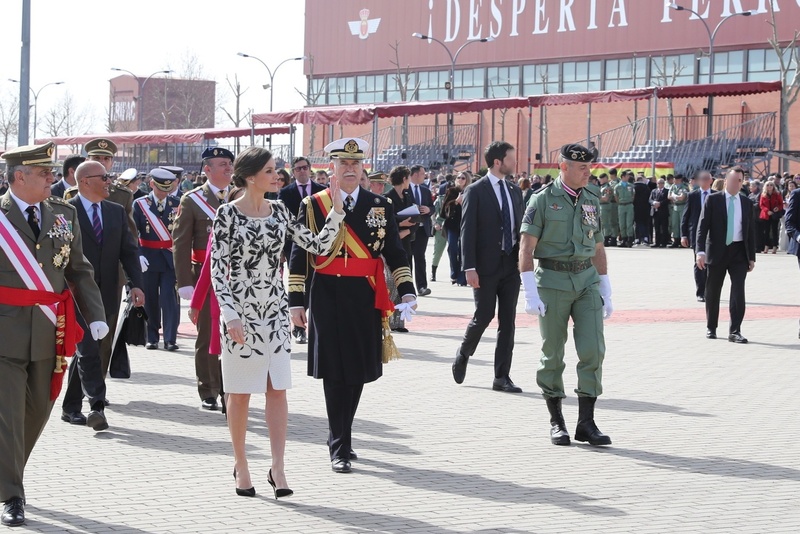 Today, Queen Letizia of Spain was at the Military base of Jarama to present the National Flag to the Infantry Regiment “Naples” No. 4 of Paratroopers. 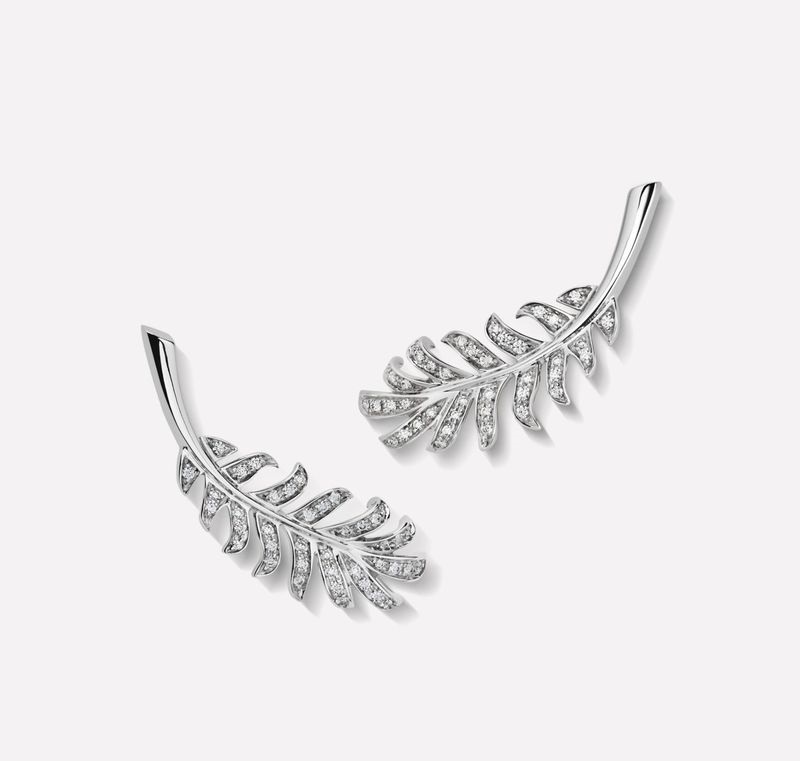 Queen presented to flags “Roger de Flor” and “Roger de Lauria” to the parachutes regiment. 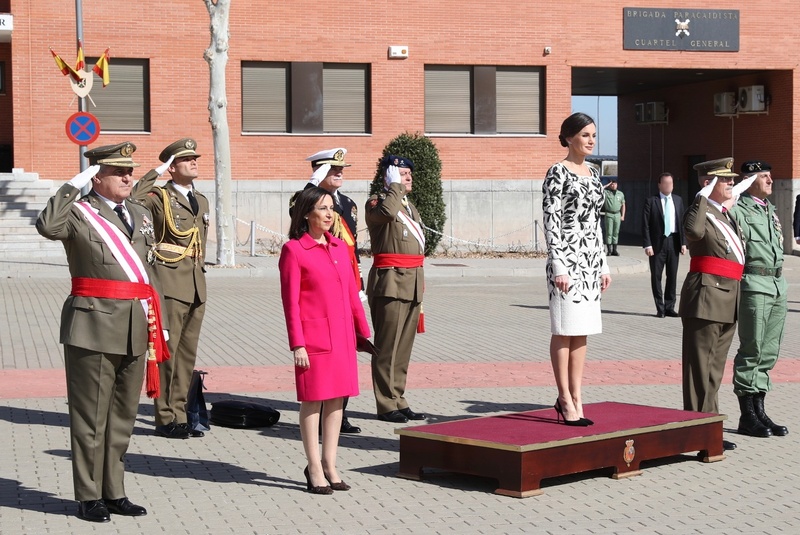 Upon arrival, Queen was received by the Minister of Defense, the Chief of Staff of the Defense and the Chief of Staff of the Army. After receiving Ordnance Honors, Queen reviewed the troops, accompanied by the Chief of Staff of the Army, the head of the Fourth Military and the chief colonel of the Force. 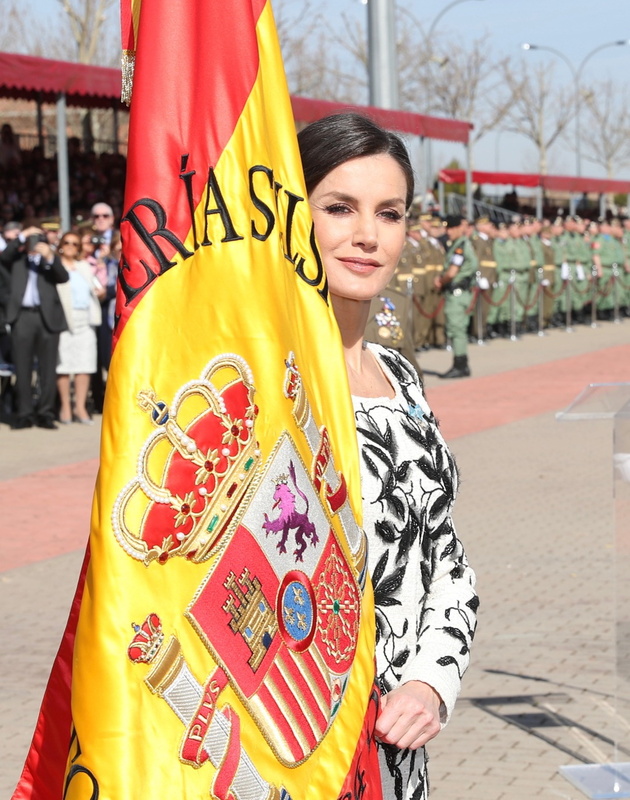 Queen Letizia with the National Flag that she then delivered to the Colonel Chief of the Force. 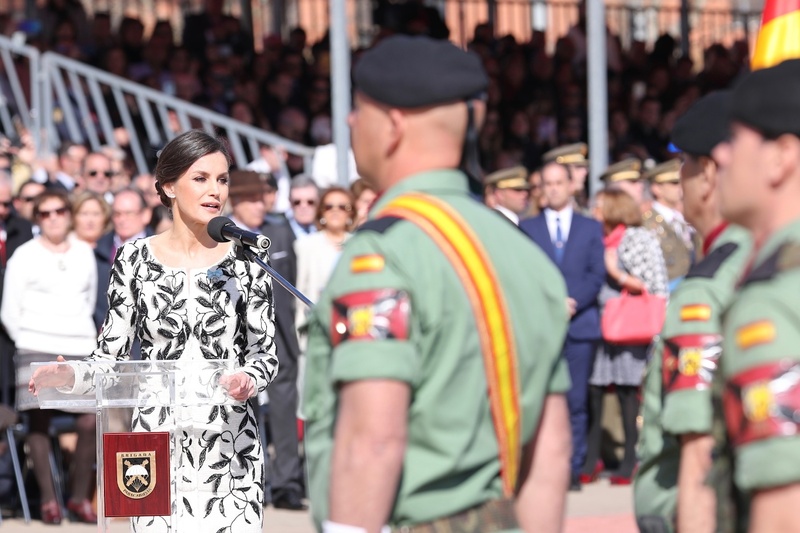 During the ceremony Doña Letizia highlighted the delivery of the regiment “inside and outside our territory. I know that since the first display of the Flag ‘Roger de Flor’ in 1991, the paratroopers have contributed in all the operations on Spain’s behalf. You have been involved without reservation in all assigned missions. 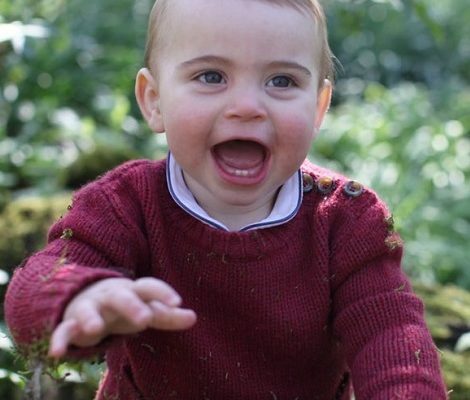 ” Also, the Queen reminded the comrades lost in exercises and operations “I want to pay tribute to them today and send their families my gratitude and my love”. 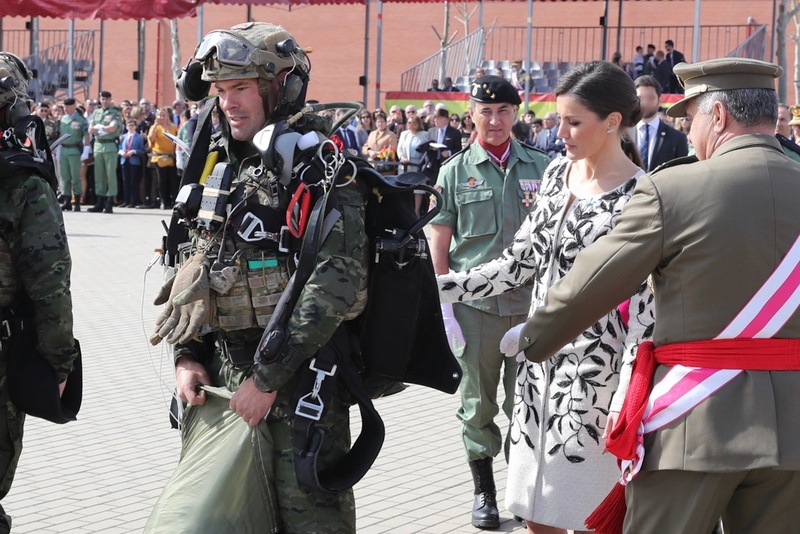 After the ceremony Letizia met with the family members of the military troops. 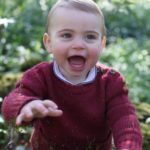 Before leaving Queen saw a practice session of the unit. 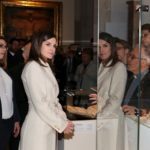 For the day, Queen Letizia brought back one of her most elegant and beautiful dress from her wardrobe. She was wearing Felipe Varela off-white broken white tweed coat-dress. 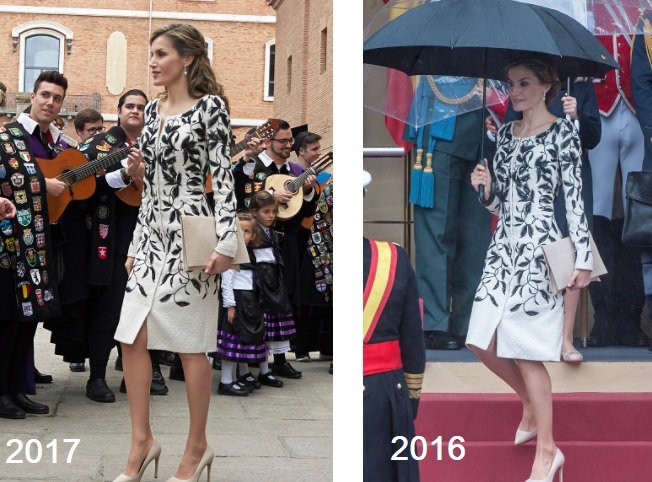 The dress featuring black beaded floral motif was first worn by Letizia on 2016’s National Day Parade and also wore during Cervantes Award ceremony in 2017. 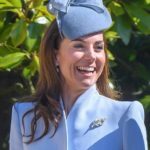 We last saw this dress in April 2018 when Felipe and Letizia welcomed Saudi Prince at Palace. 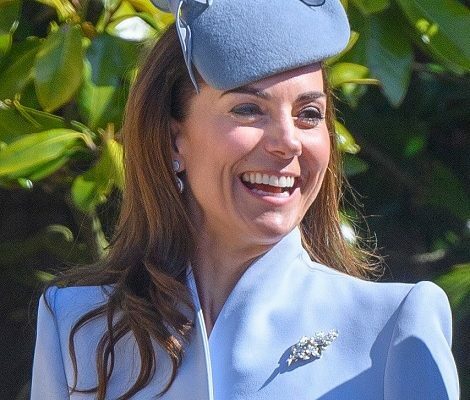 This dress is one of my personal favorite from Queen’s wardrobe so it was lovely to see her bringing it back. 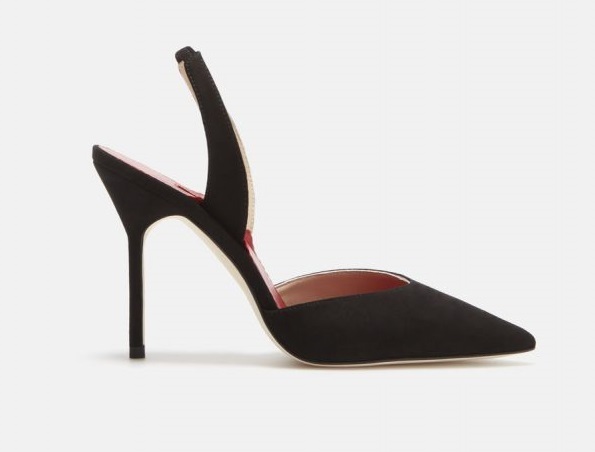 Today Letizia paired it with Carolina Herrera black sling back suede pumps. 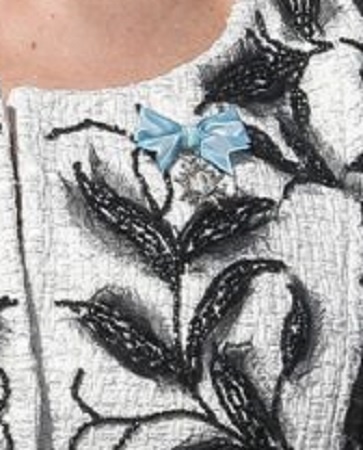 Letizia finished her look with the Commander Dame’s bow of the Order of Charles III and her Chanel ‘Plume’ earrings.